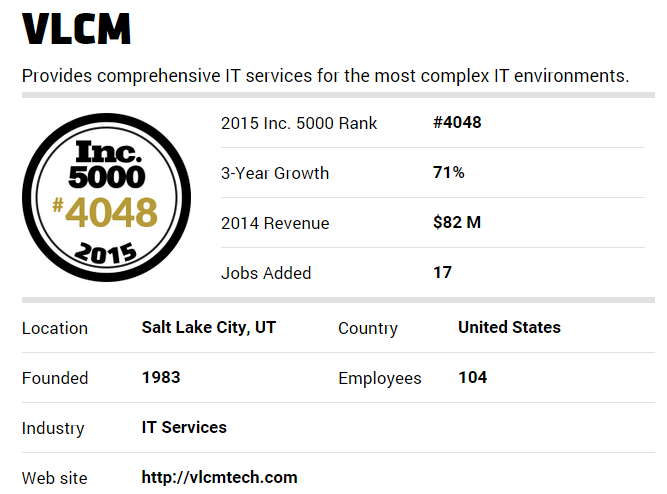 We are proud to announce that VLCM ranks #4048 on the Inc. 5000's annual list of America's fastest-growing private companies! This list represents the most comprehensive look at the most important segment of the economy - America's independent entrepreneurs. Who else found a home on the list? Companies such as Yelp, Pandora, Timberland, Dell, Domino's Pizza, LinkedIn, Zillow, and many other well-known names. The 2015 Inc. 5000, unveiled online at Inc.com and with the top 500 companies featured in the September issue of Inc. (available on newsstands August 18 to September 22) is the most competitive crop in the list’s history. We're excited to say this is VLCM's second year on the list, and we find ourselves in good company with 49 other Salt Lake City businesses.